The only pill dispensers with their own, built-in cellular connections! No need for phone line or internet! at a time. No Lifeline. 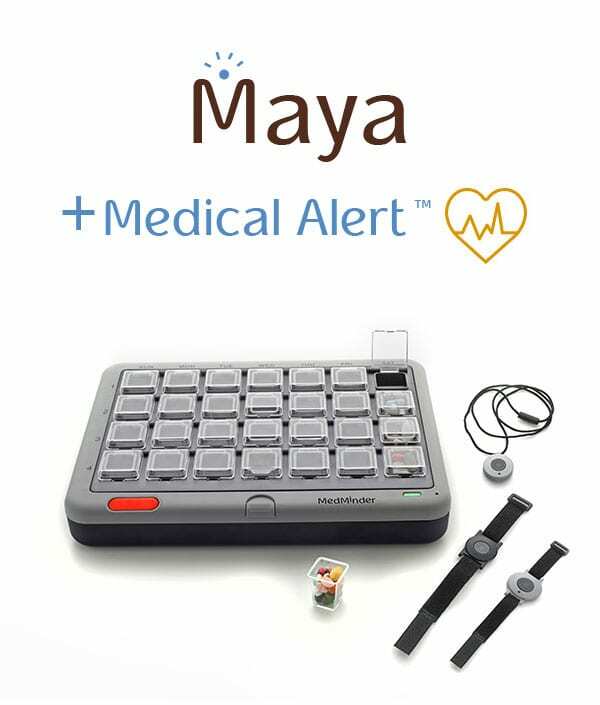 MedMinder pill dispensers remind the user to take their medications with a series of optional visual and/or auditory alerts. The reminders occur in 30-minute intervals. First the compartment will flash, then the pill dispenser will beep, then the user will receive a phone reminder. If the user still has not taken their medications, then all caregivers will be notified via phone, email and/or text message. Of course, if the medications are taken on time, there will be no reminders nor notifications. The locked pill dispensers are for those at greater risk for taking the wrong medication at the wrong time. All compartments are locked and only the specified compartment will unlock at the right time. 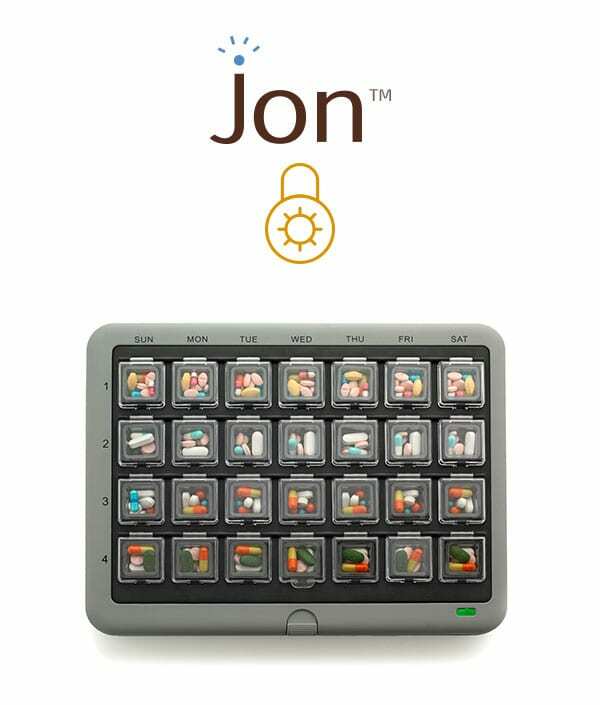 The dosage compartments can be setup to un-lock or re-lock in wider windows, before or after the scheduled dosage, to allow more flexibility for the user. 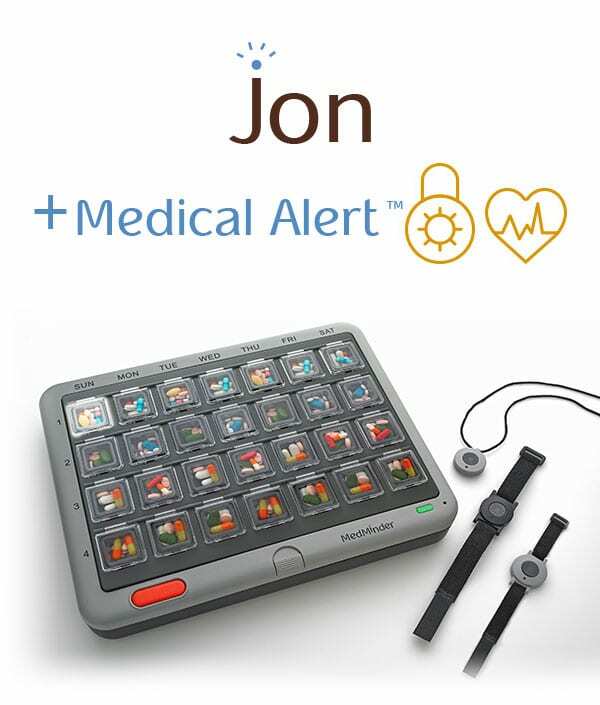 “I’ve fallen and I can’t get up!” With the push of a button the pill dispenser will open a two-way voice channel with the medical alert professionals at the UL certified monitoring center. The wireless pendants are waterproof, feature 800 feet of transmission range, a long-life battery, and have a necklace and a male or female watch band design. 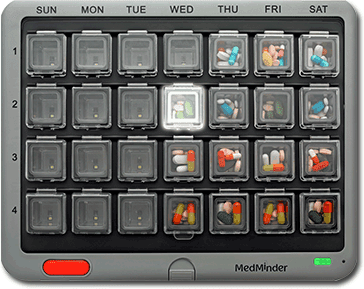 MedMinder pill dispensers have an internal cellular modem that communicates with the MedMinder remote system. All that is required is cellular network coverage. There is NO NEED for a phone line, computer, cell phone or Internet access. MedMinder pill dispensers can be filled for several weeks, depending on the number of dosages per day. 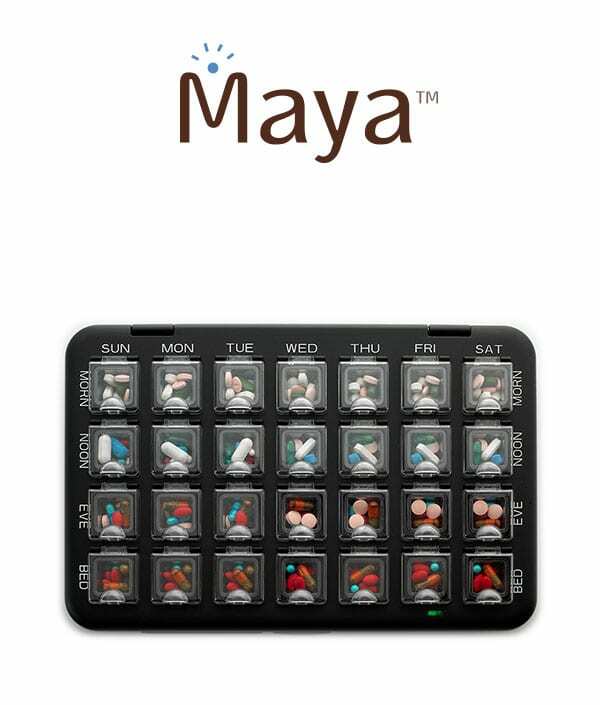 Two Dosages Per Day: The pill dispenser holds two weeks of medications. The first 2 rows become WEEK ONE and the second 2 rows become WEEK TWO. One Dosage Per Day: The pill dispenser holds four weeks of medications. Many chronically ill patients are on complicated drug regimens, typically taking more than ten pills a day. Refill trays make refilling the pill dispenser more convenient and reduces the possibility of medication errors. Refill trays can be filled ahead of time by family members, a pharmacist or caregiver and placed directly into the MedMinder medication dispenser. Caregivers can record voice messages on the MedMinder portal and our pill dispensers will play them so the user will hear a familiar voice. Custom greetings can be set as medication reminders, positive feedback, or even one-time personalized messages for special occasions. 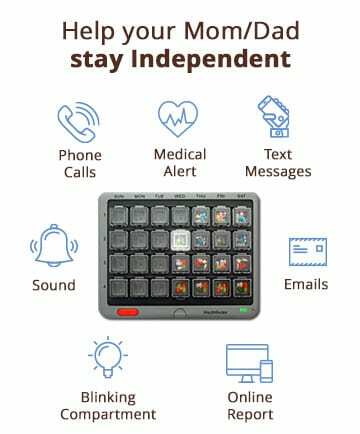 Caregivers can also type a personalized message that MedMinder converts to voice format. MedMinder allows you to have as many caregivers as needed. And if you want to add more caregivers, you can just do it. There is no extra charge for having more caregivers. 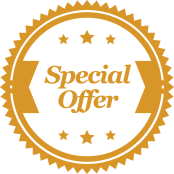 You can simply visit our secure website and add the additional caregiver(s) information, who will then be able to set their own notifications preferences. Call us to check if MedMinder is available for FREE in your state.